Deseret was the name of the first Mormon settlement in Utah. It’s name is from the Book of Mormon, meaning ‘land of the honey bee’. This territory extended between the Sierra Nevadas and the Rocky Mountains, covering a vast area in Utah. The Mormons were on a mission from God, attempting to create a model society in this new wilderness. 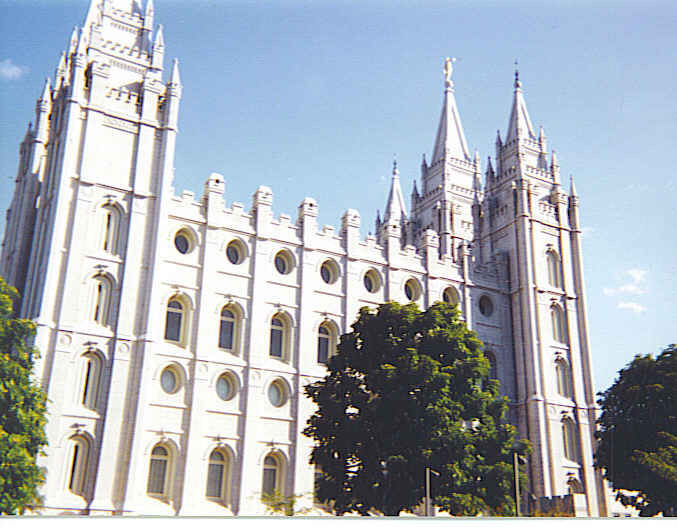 Four days after arriving in Salt Lake City, building began on the magnificent Salt Lake Temple. This Mormon Temple is the centerpiece of the city and an easy icon to spot as you walk the streets of the city. Close by on Temple Square is the Mormon Tabernacle where the Mormon Tabernacle Choir performs at selected times during the year. We have timed our stay to include a Sunday morning performance of the choir. They give us a short introduction to the astounding acoustic construction that gives the organ and choir such a unique sound. They demonstrated that even dropping a pin in the pulpit could be heard throughout the auditorium due to the fantastic acoustics. And it worked! Adding to the sound and beauty of the choir is the 11,623- pipe Tabernacle organ, whose golden pipes are hand carved from Utah lumber. This is one of the most elaborate organs in the world. The combination of organ and choir were magnificent entertainment. Of course, you couldn’t leave without wanting to buy a CD for future listening. Touring the Utah State Capitol building here, you are able to see the unique art, architecture, and history of the building. The beautiful domed rotunda with bronze sculpture groups delight the eye inside, while outside the flower gardens are exquisite. This city was laid out with the widest streets imaginable and shows a lot of foresight on the developers’ part back in the late 1800’s. 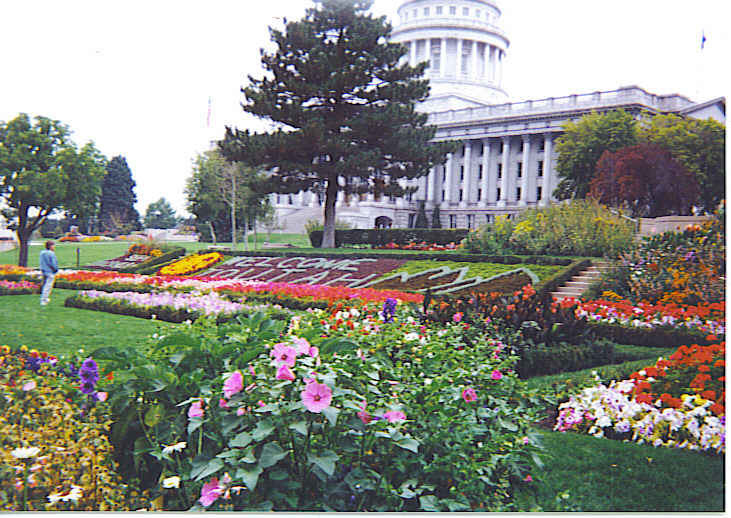 From the steps of the Capitol building, you get a beautiful view of downtown Salt Lake City. 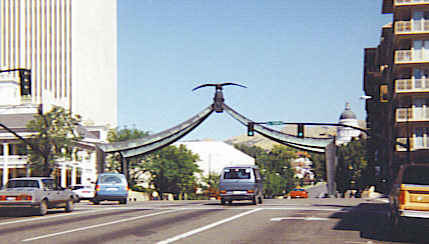 Eagle Gate , where a 4,000 pound Eagle is perched atop a bee hive, stretches across the wide street. 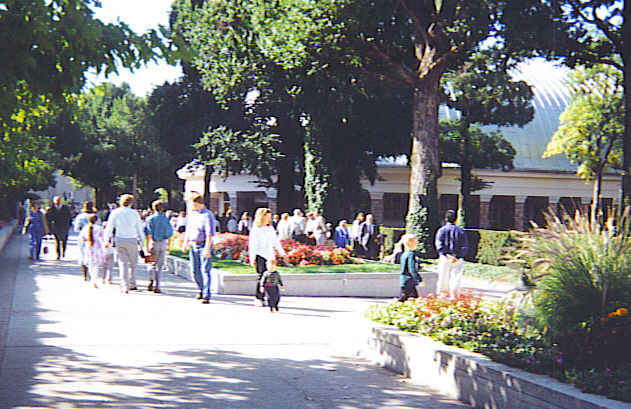 Originally built in 1859, the gate has been moved as the city developed but was originally the gate leading to Brigham Young’s farmland. 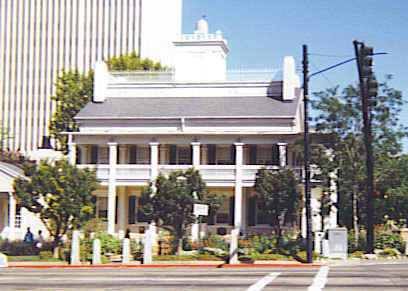 Another historic spot downtown is the Bee Hive House, which was the Salt Lake CIty home of Brigham Young. Built in 1854 with a bee hive on top as a symbol of productivity and diligence. it is the older of Young’s two local residences. Here you can see how Brigham Young and his family lived at that time. Young had numerous wives and children, being considered the most famous polygamist of the Latter Day Saints Church. 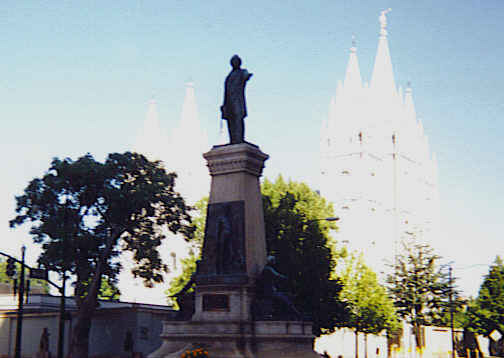 The Brigham Young Monument downtown Salt Lake CIty, at the corner of Temple and Main Streets, provides a beautiful picture with the famous Mormon Temple in the background. Most of the cities landmarks have a connection to the religious beliefs of the founding fathers. The experience at the North Visitors Center was one of the highlights of the trip to Salt Lake City. As you walked up a spiral staircase inside the building, you were greeted at the top by an 11 ft figure of Jesus with welcoming arms outstetched to greet you. What a very breathtaking surprise! Everywhere you can see the hand of the Mormon Church is still very active in this area with friendly faces at every stop along the way. This is a pleasant spot to relax and enjoy tranquility.